Output and Resource elements and Salary star are the required components for examining longevity in Four Pillars. But if not all required components are available, first look at Month branch, is it any of the following components (HO, EG, DR, IR and Salary star)? If yes, use Month branch as Longevity star. If Month branch does not have the required components, then look at Month stem. If not, then look at Day branch. If not, then look at Hour stem. In this sequence. Out of these 3 (Month stem, Day branch and Hour stem), if all have required components, use Day branch as Longevity star. If Month stem and Hour stem both have required components and Day branch do not have, use Month stem as Longevity star. When Longevity star is weak and luck period’s elements is controlling Longevity star, person’s health will be affected. When Longevity star is strong and luck period’s elements is supporting Longevity star, person’s health will be affected too. [Seems to me like same concept like DM; strong must not be supported, weak must not be controlled] When Longevity star, House of Life and House of Body encounters “chuan jue” in a decade luck pillar, person is likely to pass away within that corresponding 10 years. First, look Longevity star, then House of life and House of Body. 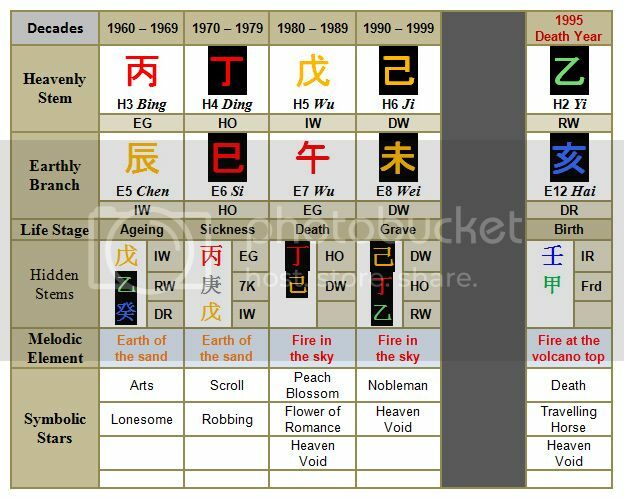 The specific date is the year when Longevity star appears, especially if that stem/branch is also Grand Duke (for that year), White Tiger, Big Deplete, Funeral Door or Funeral Guest. In this chart, Longevity star is Gui water and it is weak in the chart. Travelling along metal and water decade luck pillars, there is no problem. 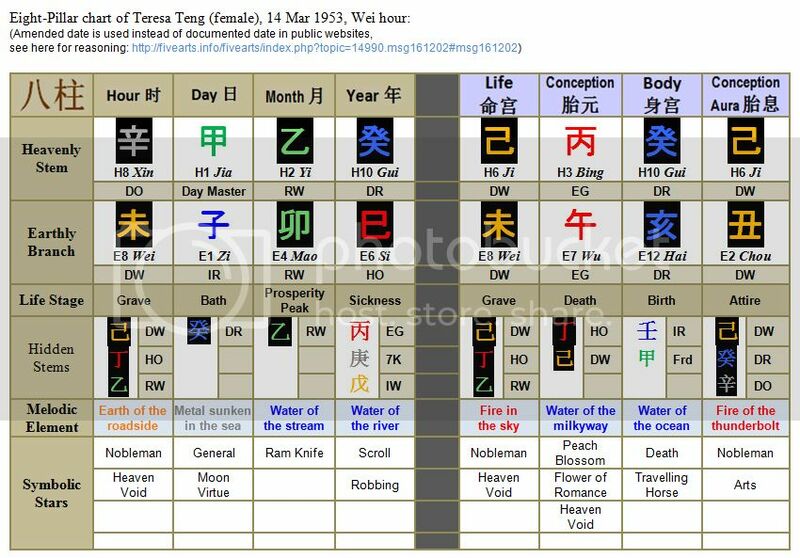 When person encounters Ji Chou luck pillar, the earth elements control the water Longevity star, Chou also clashes its sitting branch (stem & branch are together one). Person’s lifespan hence ends in that decade. In Gui Wei year (2003), the Longevity star appears and that is the year person passes away. Moreover, Big Deplete also appears that year. After analysis, the author reprimanded the friend, “Why give me a dead man’s bazi?” In reality, the person passes away in 2003 due to cancer. In this chart, Longevity star is You metal and it is flanked and clashed by 2 Maos in the chart. House of Life “chuan jue” with House of Body. Hence person’s lifespan is not long. In Ding Mao decade luck pillar, 3 Maos clash 1 You, determining that 10 years is to be extra careful. Geng Chen year combines and controls the You metal Longevity star. Hence year 2000 is a possible death year. At that time of consultation, he reprimanded the author severely. But eventually in year 2000’s 2nd lunar month, he passed away due to car accident. Wu luck pillar “chuan jue” with Longevity star Hai. In 2015 Wei year, White Tiger star appears; that year he passed away due to liver cancer. *Note: I think the Grand Duke here is referring to person's birth year branch, not "for that year". Earth element branches (Four Tombs) can NEVER be Longevity star(s). Full procedure of selecting Longevity star. *If after satisfying the criterias in 1st post + decade luck pillar's lifestage is also Death/Grave/Repose, the book says "confirm will die". I think he's referring to Longevity star instead of House of Body. That book has quite a few typo-errors. I spotted quite a few myself also. Goes to show that even experienced professional masters are not perfect. In Jia Yin decade (2005–2014), that decade is “Changing Jia Luck”. From warm yang Jia changing to ice cold yin Gui. Seems like Changing Jia Luck's cause of death is mostly illness. (Master Xu Lewu also suffered from severe illness, seriously ill to the verge of death.) Text stated Changing Jia Luck during youth is "small worry" but this is not the case here. In 2007, there is appearance of Longevity star Hai. If following rigidly the rules, we should choose Gui as Longevity star but in practical, we need to be flexible. If Yin hour is the correct hour, Gregory's chart would also satisfy Golden Lock & Iron Snake gate. *Note: Amended date is used for Teresa Teng's chart instead of documented date in public websites, see here for reasoning: http://fivearts.info/fivearts/index.php?topic=14990.msg161202#msg161202. Due to proximity of criterias satisfied, I think there are 2 Longevity stars in Teresa Teng’s chart – Zi and Si. In Ji Wei decade 1990-1999, Wei pierces Zi her main Longevity star in Day branch. A dangerous decade! In 1995 Yi Hai year, Hai clashes Si her 2nd Longevity star in Year branch. With both Longevity stars clashed, 1995 is a dangerous year! She passed away that year while holidaying in Thailand. Interesting, it makes more sense about what happen to her. Also your correct on 1995 being a dangerous year. - Death Decade pillar also fu yin with House of Life. - She passed away in a Heaven Void year within a Heaven Void decade. Page created in 0.311 seconds with 63 queries.